so be watchful and seek help if you have cause to be worried about your pet's health. Asparagus Fern Asparagus setaceus Contains a wide variety of poisons resulting in large range of symptoms. Bird of Paradise (seeds) Strelizia reginae Gastrointestinal tract affected by plant toxins. Bleeding Heart (foliage, roots) Dicentra formosa Poisonous in large amounts, contains convulsants. May also cause dermatitis. Bluebell Hyacinthoides Harmful if eaten in quantity. Boxwood (twigs, leaves) Hebe odora Upset stomach, heart failure, excitability or lethargy. May also cause dermatitis. Bracken Pteridium aquilinum Thiamine deficiency, acute haemorrhagic syndrome, blindness, tumours. Buckeyes (nuts & immature growths) Aesulus species Harmful if eaten in quantity. Burning Bush Kochia scoparia Toxic if eaten, causes nausea and vomiting. May cause skin allergy. Buttercup Ranunculus species Juice may severely injure digestive system. May also cause dermatitis. Calico Bush Kalmia species Harmful if eaten in quantity. 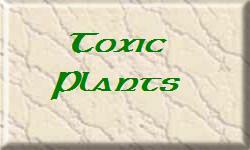 Calla Lily (leaves) Zantedeschia species Harmful if eaten in quantity.